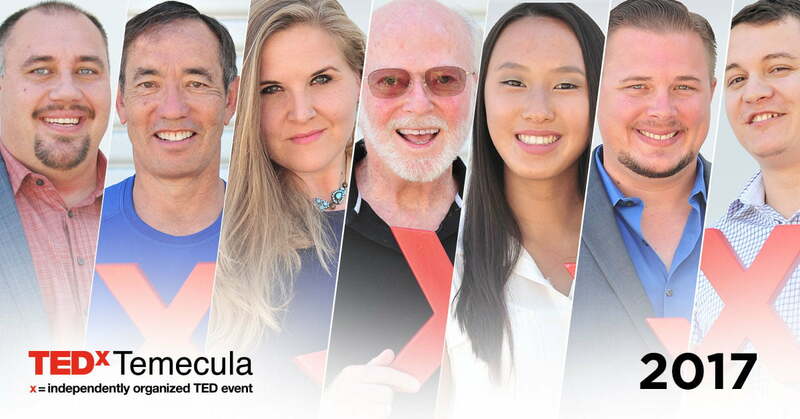 Press Release (ePRNews.com) - TEMECULA, Calif. - Sep 12, 2017 - Organizers at TEDxTemecula announced today the speaker and performer lineup for its sixth annual event happening Saturday, September 30, 2017, at the Old Town Temecula Community Theater. Tickets are available at www.tedxtemecula.com. The theme this year is “On The Brink,” and speakers will share thought-provoking perspectives and ideas worth spreading that will cause the audience to think and consider the possibilities. “With five conferences under our belt, we decided to try some new things this year, to take some chances, to get ourselves On the Brink,” said Jim McLaughlin, Organizer, TEDxTemecula. The event will be held from 10am to 4pm, with presenters speaking for no more than 18 minutes each. A lunch is provided with the ticket and provided by local E.A.T. Marketplace. Aaron Hardin, CEO, Hardin Scientific: Aaron created Hardin Scientific to exponentially increase the rate of research and discovery while reducing errors and expenses to laboratories. His company was recognized as one of the most innovative companies in the Temecula Valley by the Economic Development Coalition. Adam Rideau, Consultant/Law Student: Adam created a nonprofit organization that focused on mental health issues experienced by veterans and first responders. Today he focuses on the growing problem of individuals experiencing homelessness; focusing on community organization within the field of social work. Jerry Hizon, Medical Physician: Dr. Hizon has specialized in Sports Medicine, working for a number of pro football events including the San Diego Chargers. He was awarded Distinguished Citizen of the Year recognition by the city of Temecula for support of local high school sports programs. Maggie Young, Author: Maggie is a screenwriter and author of her feminist memoir, Just Another Number. To escape a turbulent childhood, she enlisted in the United States Navy and was one of the first women aboard a freshly integrated destroyer crew. Matt Rahn, Professor/Consultant: Dr. Rahn works as a scientific, policy, and legislative consultant, providing support for environmental planning and land use, wildfire issues, renewable energy, habitat conservation, endangered species, and sustainability issues for government agencies, tribal government, private developers, and non-profit organizations. Patrick Murphy, Fine Artist: Patrick’s dimensional fine art is a unique combination of digital photography, sculpted paper, acrylics and pastels that result in eye-popping, three-dimensional impressionist pieces. He has received numerous awards for his dimensional healing art. Stephanie Lai, Student Journalist: Stephanie is a local high school senior, Editor-in-Chief of the school paper and reporter for the Valley News. She teaches and inspires writers on technique, ethics and sustainability of journalism at all scales. In the spirit of ideas worth spreading, TEDx is a program of local, self-organized events that bring people together to share a TED-like experience. At a TEDx event, TED Talk videos and live speakers combine to spark deep discussion and connection. These local, self-organized events are branded TEDx, where x = independently organized TED event. The TED Conference provides general guidance for the TEDx program, but individual TEDx events are self-organized. TED is a nonprofit organization devoted to Ideas Worth Spreading, usually in the form of short, powerful talks (18 minutes or fewer) delivered by today’s leading thinkers and doers. Many of these talks are given at TED’s annual conference in Vancouver, British Columbia, and made available, free, on TED.com. TED speakers have included Bill Gates, Jane Goodall, Elizabeth Gilbert, Sir Richard Branson, Monica Lewinsky, Philippe Starck, Ngozi Okonjo-Iweala,Sal Khan and Daniel Kahneman. North Coast Rep Proudly Presents Robert Dubac’s The Male Intellect: An Oxymoron?